Overkill has finally revealed more of their upcoming video game based on Robert Kirkman’s The Walking Dead. While the project was announced some time ago, very few details were released. Now, thanks to an atmospheric new teaser, we have a stronger idea of what to expect. The game is an FPS with four-player co-op gameplay, and takes place in Washington D.C. after the Walkers have set about ruining the world as we know it. Players will get to pick one of four different characters (the selection looks pretty varied), all of whom have their own plot lines, abilities, and skill trees. This alone should add longevity to the game, and mean your choice is based on more than the characters’ superficial aspects. The teaser trailer focuses on Aidan, one of the four. We see a glimpse of him in his life before the zombie plague, clearly frustrated with things as they are. We then see him in the present, surrounded by Walkers and the remains of what once was. Aidan is no longer clad in a suit and juggling phone calls – he’s wielding a brutal baseball bat with what seems to be some remarkable skill. It’s a neat way to introduce the character, and suggests that maybe he’s not entirely sorry to see the world as it was end. It’s also worth pointing out that this is based on Robert Kirkman’s long-running comic-book series, rather than the television adaptation that’s become one of the biggest shows ever made. Whether the characters under your control will end up meeting or confronting any of the heroes or villains we know is yet to be revealed, but while familiar faces are likely to appear in some form, the game’s Washington D.C. setting might make that difficult. 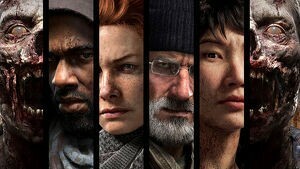 Overkill have expressed their desire to create their own new characters within Kirkman’s universe, rather than using the iconic figures already established. While readers of the comic and viewers of the show may be disappointed by this, it’s encouraging to see Overkill taking so much interest in really exploring the world and its possibilities, rather than putting out a lazy re-tread of what we’ve already seen before. Overkill has also been working closely with Kirkman and his team to ensure their game has the right look and feel. Though it’s obviously not aping the visuals of the comic (though an FPS modelled on Charles Adlard’s black-and-white artwork would be interesting), it should capture the tone and atmosphere pretty well. The Walking Dead’s characters will be able to approach situations in a number of ways, relying on stealth or taking a more direct approach. Combat will be both melee and shooting, with Aidan clearly more comfortable in the former than the latter. 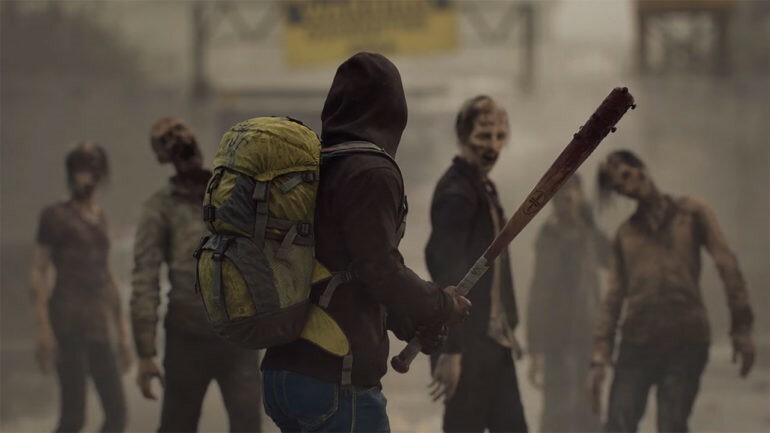 Overkill’s The Walking Dead will feature numerous missions and raids, and you’ll earn supplies and acquire survivors to reinforce your base camp. Throughout, you’ll have to fight off Walkers and enemies with a pulse too – an exciting prospect, which is obviously in keeping with the series’ universe. It’s still unclear yet just how many survivors you will be able to bring back to your base, and what you’ll have to do to keep them on your side. Will there be individual side-quests to gain approval and build morale in your group? Will people be vying for leadership? Hopefully, these and similar elements will come into play. Some kind of crafting mechanic, as seen in Dead Island, would be a treat, and help to make you feel as if you’re truly working to survive. There’s certainly oodles of potential in a co-op FPS based on The Walking Dead, given the emphasis on team-work and survival. Overkill could capture the heart of the source material even more with giving players tough decisions to make and branching conversations, though they have to avoid stepping on Telltale’s toes. 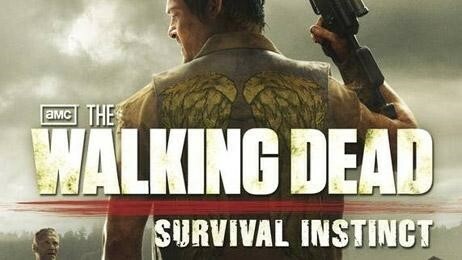 There has been another FPS based on The Walking Dead before: Survival Instincts. That was based around Daryl and Merle, and wasn’t exactly the best use of the property. Overkill have obvious experience in the FPS genre with their Payday titles, and seem committed to making a game that lives up to the comic-books. We won’t know whether they’ve succeeded or not until autumn 2018, but the little revealed so far is pretty exciting stuff! What do you want to see in Overkill’s The Walking Dead when it’s finally released next year? Let us know!